Aurora, Beyond Wayne’s World Come In! Located 35 miles from Chicago, the City of Aurora is the second most populous in the state of Illinois. Our downtown is bisected by the Fox River and centers on Stolp Island (a real island), where settler Joseph Stolp constructed a woolen mill in 1835. Stolp Island is now the site of the award-winning Paramount Theatre, the popular Hollywood Casino, as well as the Riverfront Playhouse, the David L. Pierce Art and History Center, and a number of restaurants, museums, retail shops and more. It takes about 10 minutes to walk the entire downtown region from one side to the other, and parking is plentiful. For 100 years, downtown Aurora was a powerhouse of manufacturing, driven in part by the downtown location of the Chicago, Burlington and Quincy Railroad’s roundhouse and locomotive shop. The railroad shops closed in 1974, and many of downtown’s historic buildings have since been reclaimed and repurposed for retail, education, dining and entertainment or as part of a burgeoning arts movement. With a population of 200,456 it is second only to Chicago. But did you know that Aurora got its nickname “City of Lights” by being the first city in the country to have all electric street lights? Or that Aurora has been scouted for top-name films in recent years? Michael Mann’s “Public Enemies” film starring Johnny Depp as 1930s bank robber John Dillinger filmed a scene at the Art Deco style Paramount Theatre in Downtown Aurora. In 2017, Aurora Downtown helped the city to celebrate the 25th anniversary of Wayne’s World. We had an excellent time, and attempted to create a world record by headbanging to Bohemian Rhapsody. In the 1800’s Aurora was home to The Chicago Corset Company. It was the second largest company of its kind in the world, and employed over 500 women. The company produced over 2 million corsets annually. Many of Aurora’s downtown buildings were designed by George Grand Elmslie, who was employed by the same company as Frank Lloyd Wright. The city’s second largest employer is Hollywood Casino, located in downtown Aurora. Leland Tower is the tallest building in Aurora; it was at one time the tallest building in Illinois outside of Chicago. Initially serving as a hotel, The Leland Hotel was designed by Anker Sveere Graven and Arthur Guy Mayger and built in 1928. The building is most well-known for the Sky Club, a dinner and dancing club outfitted with elaborate decor and furnishings of the highest quality. Most famously, blues musicians like John Lee “Sonny Boy” Williamson recorded in the Sky Club, something that Aurora tries to preserve in its annual Blues on the Fox festival. Leland Tower is now home to Leland Legends Pub and Grill, which pays homage to the building’s blues history. The New York Street Memorial Bridge is perhaps the most beautiful and unique of the Stolp Island collection of arch bridges. Although today the bridge has the appearance of two separate bridges for the East and West channels, just like the other six bridges connecting to the island, the New York Street Memorial Bridge is technically a single bridge spanning the entire river. 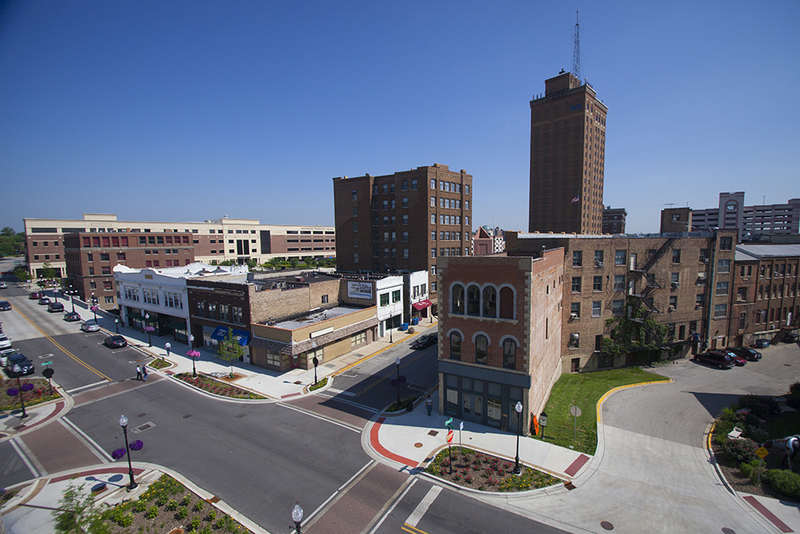 We invite you to explore Aurora and its historic and vibrant downtown! Let us know what you love about Aurora, Ill.
Want to see more of Aurora? Click here for more things to do. Check out the Visitors Guide here. Looking for things to do in downtown Aurora? Click on our Explore tab.